When I was a kid and went out to dinner with my family, few things made me feel as grown up as getting to order a Shirley Temple. Made from ginger ale, grenadine syrup, a bit of OJ and topped off with a maraschino cherry, this drink was the most special of special treats to me. When we went on vacation this summer, I would occasionally make my kids (and me and hubby) special cocktails to cap off a long day of play. Using just a bit of juice, some cut up fresh fruit and sparking water — and a fun straw or umbrella — it was something the kids looked forward to every day and it was so cute to watch them sit there each evening holding their pretty drinks and feeling grown up. This virgin sangria is my take on the beloved Shirley Temple of my youth, but without all the sugar and high fructose corn syrup from the soda and grenadine. 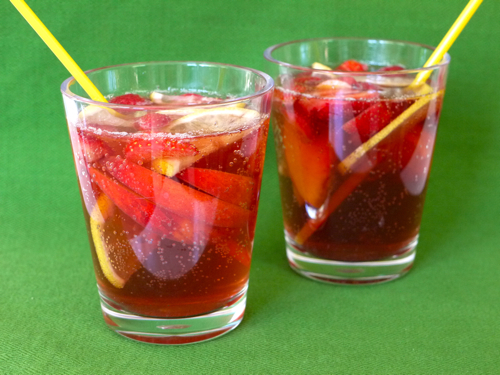 And when you get into the fall and winter months and you want to pretend you're on vacation even though you can't get away, just substitute any of your favorite seasonal fruits to make a yer round refreshing cocktail that everyone in the family can enjoy. 1. Place the first 4 ingredients in a pitcher and chill in the fridge for one hour. 2. When ready to serve, stir in 2 cups of sparkling water. Huge fail? Either don't add the Club Soda at all or just add some regular water to dilute it and it should still taste good and do what it was intended to do, which was provide a more nutritious drink option. It's a \"fail\" because you won't serve it? Modify it or just wait for tomorrow's wonderful recipe! Maybe try mixing apple juice or white grape juice in instead. My DD hates carbondated beverages as well (shes 9) so I just sub in apple or grape when it calls for soda water/soda. This sounds fantastic! We always have plenty of sparkling water in the house as we prefer it over the high sodium content of club soda. Yummy..and good for mommy's too who can't have the real thing when preggo :) I get so bored of water...this is great..as always..truly grateful for all your creative ideas to satisfy everyone's tummies! This sounds so yummy, for kids and mommies!! The only pop I had growning up was soda water/club soda (Or water pop as I in my infinite wisdom dubbed it when I was 5 lol) And even now it is my favorite kind of pop, squeeze of fresh lemon and a ton of ice, doesnt get much better!! I had to smile immediately as I too felt rather sophisticated ordering a Shirley Temple when out with my dad at the local steakhouse. This is a great idea I cannot wait to share with my son a drab, gray winter day to lift the spirits!! Thanks much. Yum! Thanks, my girls will love this! I loved ordering Shirley Temples as a young girl too, but yours sounds fancier than anything I ever had, which I assume was Sprite/7up with grenadine syrup, still tasty! Just read the \"6 reasons water is the best drink...\", but this looks like a refreshing treat!